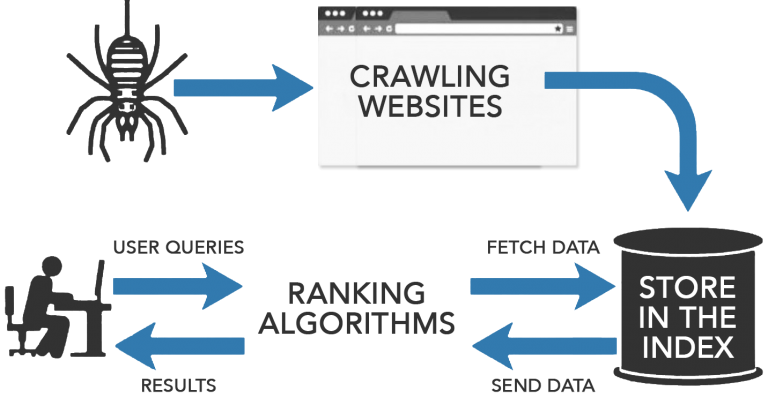 crawlOPTIMIZER is a new SEO software tool that helps you with optimizing your crawl budget, so that you are able to use/control Googlebot in the most precise and efficient way through your own website. Do you know which content of your website is beeing crawled by Googlebot? No? Then you should have a deeper look into this tool – check it out! The cloud based tool crawlOPTIMIZER gives you exact information, which of your website’s content is crawled by Google by means of your log files. Based on predefined analyses & evaluations crawlOPTIMIZER shows you unknown SEO potentials for maximizing crawl-efficiency, so you are able to always feed Google index updated content as fast as possible. Get more unpaid search engine traffic. crawlOPTIMIZER analyzes Googlebot log files fully automated and files them on a secured server in Germany up to 5 years long. Our simply arranged crawlOPTIMIZER dashboard allows you to monitor Googlebot activities 24/7. Due to the saving of log files and our specially developed logfile explorer even retroactive analyses are possible at any given time. Predefined analyses & evaluations help even new to the subject SEO users to easily discover crawling difficulties. Only Googlebot log files will be analyzed & filed – no user related data! All GDPR requirements are met. For whom was crawlOPTIMIZER developed for? Log file analyses made under an SEO aspect offer every digital marketer unknown potential for optimization. crawlOPTIMIZER is for everyone that is responsible for unpaid search engine traffic in a company and doesn’t have a lot of time for detailed log file analyses or specific knowledge. crawlOPTIMIZER was specifically developed for websites that contains a few thousand pages or online ventures with a big interest in increasing their unpaid search engine traffic. Why do I need crawlOPTIMIZER? Without crawling there is no indexation and thus no google search engine ranking. Your website can only be found via Google search, if it has been added to the Google-Index. Because of this Googlebot (also called Spider) crawls every available website worldwide daily searching for new and updated content. By using various onsite optimization measures you are able to influence this crawling process and further decide which content is added to the Google-Index and which content will be crawled more frequently. What's the purpose of crawlOPTIMIZER? All measures are meant for increasing unpaid search engine traffic. crawlOPTIMIZER offers insights on how Google crawls your website, thus which content Google is able to crawl and which one it isn’t. This information is necessary because without being crawled there is no ranking and thus no search engine traffic. • What does Google use its resources for and where are they wasted? • Is my content being crawled? • Which content is not being crawled? • Does Googlebot have problems while crawling my website? • Where is potential for optimization? Get to know which pages are crawled by Google. Goal: decide upon measures that are improving the crawling process accordingly. 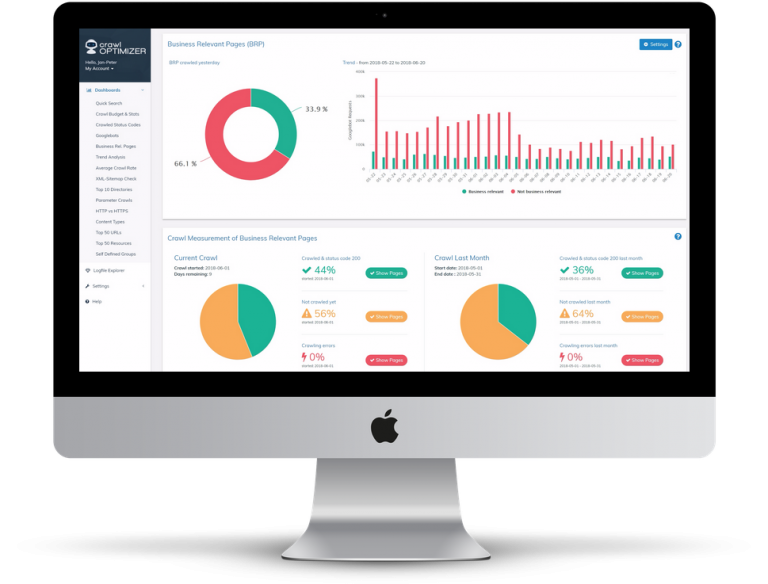 The dashboard represents the tool’s core with ready-to-use & relevant evaluations. Using it saves you a lot of precious time and money. Finally retroactive log file analyses can be done without effort! Thanks to log file storing in a save cloud. Easy access 24/7! All predefines analyses & evaluations are prepared in an easy understandable way – even if you don’t have an SEO background. For the easiest way to access your log files, we have developed many options to choose from. The one-time setup is extremely easy to do. If you have any questions we are always there to help. Also we are here to assist you with your initial setup. We are happy to be of service if you want us to talk to your IT or hosting provider. crawlOPTIMIZER’s core pieces are the dashboard and the log file explorer. To make your work routine easier our dashboard contains complete evaluations based on your log files. 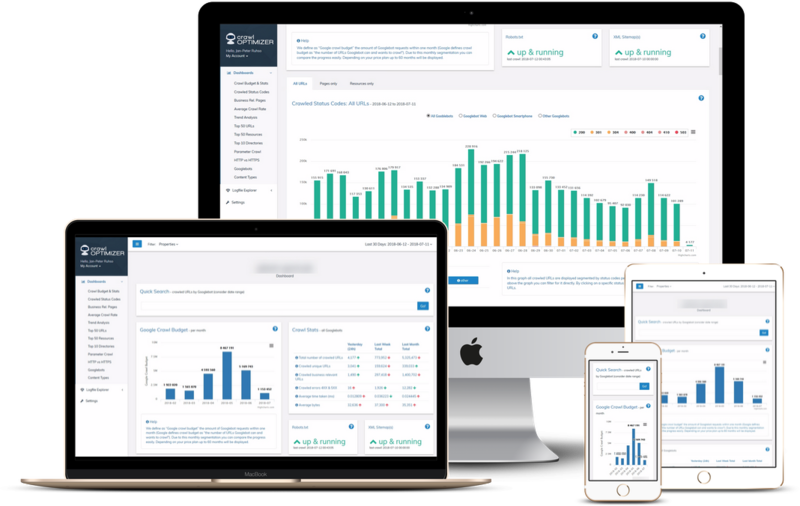 Time consuming, manual log file analyses via Excel or ELK (Elasticsearch, Logstash, Kibana) are obsolete because of our dashboard where all important KPIs are predefined and made graphically available. All KPIs & evaluations are prepared in a way that even people without SEO background are able to understand them. Everyone that tried to do log file analyses via Excel knows its related problems: bigger log files up to a million entries can’t be processed. Because of this you have only been able to analyze a snapshot of the googlebot. Our solution: crawlOPTIMIZER’s log file explorer. Because your log files are automatically stored and archived on our high-performance servers, you have easy access from everywhere all the time. Thus you are able to easily do long time & retroactive analyses. Our log file explorer offers you various filter options, so that you are able to do individual analyses & evaluations. Just a few clicks are needed to access needed data & information. You can connect now to your Google Search Console API and enrich your “URL-based” log data by clicks, impressions, CTR… Yeah! 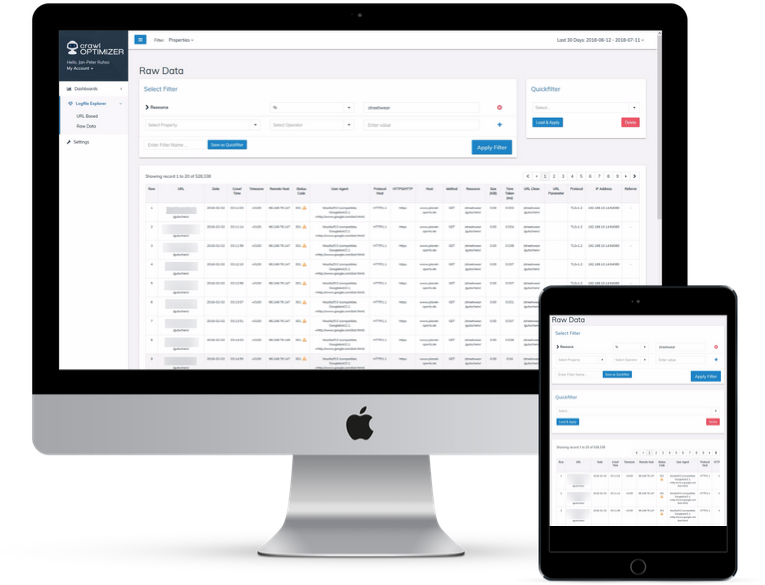 You need more than 500,000 requests per day or would you like to use the tool for your agency? Then request an individual offer. Get in contact now! For further information feel free to contact us via email or phone +43 (1) 577 35 49. Need support or got questions? Get in touch!